Sludge Reducer blocks contain billions of beneficial bacteria and enzymes that quickly break down the unsightly wastes that accumulate on the bottom of ponds as a sludge layer. Sludge Reducer blocks are also ideal when setting up a new pond and during the spring start-up and fall shutdown of established ponds. 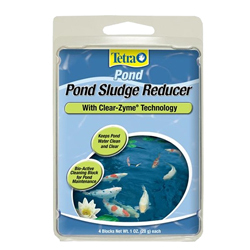 The blend of bacteria and enzymes is beneficial for developing and maintaining the pond's biological balance resulting in a cleaner and clearer pond.